and brings it to life. Using original artwork, it's a new spin on a story that's been told many times. New art runs throughout much of the release, including several insert sets. Every hobby box comes with one premium card, which include Panorama Sketch Cards, Film Cel Relics and Sketchagraphs. 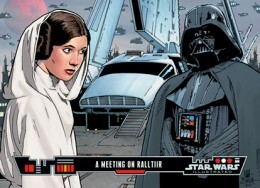 The 2013 Topps Star Wars Illustrated: A New Hope base set has 100 cards. While a lot of the radio drama and the film overlap, there are some differences. These become a central part of the set. 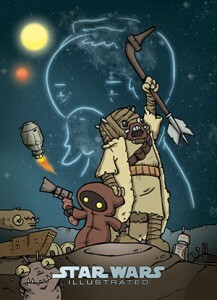 Base cards use new artwork, adding further levels of interpretation. For long-time Star Wars trading card collectors, it's kind of like the Galaxy line but with a tighter focus. The base set has three levels of parallels. Black are inserted 1:12 packs. Bronze cards fall one per box. Hobby-only Gold parallels are limited to ten copies each. Some may wonder why 2013 Topps Star Wars Illustrated has just one premium insert per box versus the two that have been included in other recent sets. There is a slightly more high-end feel to many of them. 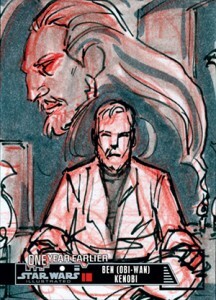 Panorama Sketch cards are the same size as a book card, double the size of a traditional sketch card. Film Cel Relics use real 35mm cels taken from a print of the original Star Wars film. Panorama Sketch Cards and Film Cel Relics are available in roughly equal quantities, with about 3,000 total cards each. Sketchagraphs are autographed sketch cards. 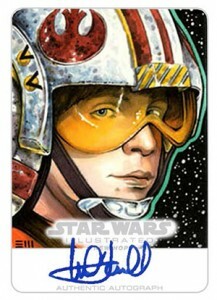 They use original artwork done directly on the card, just like a regular sketch card. An autograph is also included. Signers include actors from both the 1977 film and the original radio drama. There are approximately 1,000 Sketchagraphs. Other premium inserts include Printing Plates and the original artwork from the set's six-card foil puzzle. 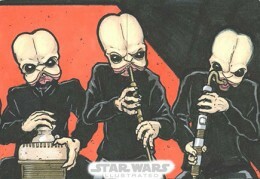 2013 Topps Star Wars Illustrated is rounded out by four basic insert sets. One Year Earlier (18 cards, 1:2 packs) imagine what happen in the months leading up to A New Hope. Movie Poster Artist Reinterpretations (nine cards, 1:3 packs) give participants a chance to give their own spin on the iconic poster. Etched Foil Radio Drama Puzzle (six cards, 1:8 packs) recreates a scene from the program. The Mission: Destroy the Death Star (12 cards, 1:12 packs) outlines the Rebel's plan to take out the planet-destroying weapon. 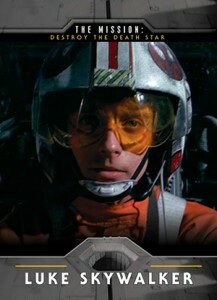 Like the 2013 Topps Star Wars Jedi Legacy The Circle is Now Complete inserts, collectors can register their Mission cards on the Topps Star Wars Facebook page. Those who enter all 12 cards receive an exclusive Death Star bonus card. Star Wars Card Trader: HUGE CTI Illustrated Lot (90) - including 7 Awards! Featuring 100 cards. Shop for sets on eBay. 20 cards. Stated total print run of approximately 3,000 for all cards combined. There’s two more cards that should be on the checklist — light and dark side cards that were only included with the radio drama special release, but are technically still part of the set!